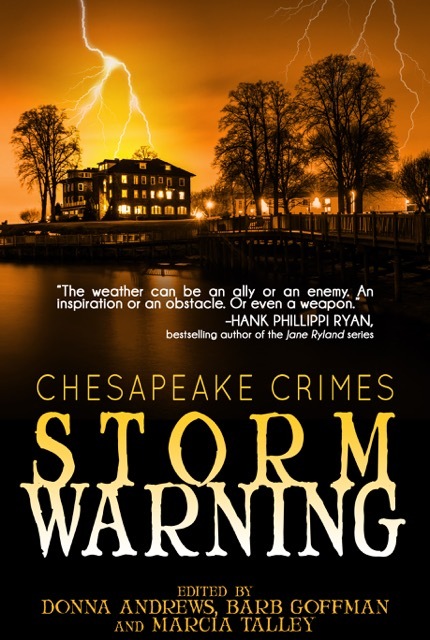 This weekend—on Saturday, May 14—contributors to the new anthology Chesapeake Crimes: Storm Warning will be gathering for a launch party at The Writer’s Center, 4508 Walsh Street in Chevy Chase, MD. The event begins at 1:30 p.m. and runs until 3:30 and is open to the public. I’m proud to be among those contributors to the book (my story “Parallel Play” rounds out the collection), and I’m looking forward to joining other writers for this celebration and mass signing. Participants on Saturday will also include Donna Andrews, Shaun Taylor Bevins, Diane Davidson, Linda Ensign, Barb Goffman, Adam Meyer, Alan S. Orloff, KM Rockwood, Lauren Silberman, Marianne Wilski Strong, and Robin Templeton—as well as co-editor Marcia Talley and two members of the selection committee: David Dean and Sujata Massey. (Unfortunately not in attendance: Tim Bentler-Jungr, Carla Kaessinger Coupe, Mary Ann Davidson, and Kim Kash; plus B.K. Stevens of the selection committee, and Hank Phillippi Ryan, who penned an introduction for the book). Come join the fun and get your own copy of the anthology signed by many of the authors in one fell swoop. And if you don’t already have a copy, no worries: Mystery Loves Company will be selling books on Saturday throughout the event.